Warning: Do NOT eat anything before heading to the Port Douglas Sunday Markets. You’ll want to save every square inch of belly real estate for your own version of The Bachelor when you decide who gets your dollars and what deliciousness gets to come home with you. Ever used pedal power to juice your own sugar cane frappe? Have you ever eaten Fruit Poo? What about tasting pineapples so ripe and juicy you can practically taste the tropical sunshine? Well folks, welcome to the Port Douglas Sunday Markets. The famous Port Douglas Markets is a mash up of farmers and makers. Being a ‘Cotter’s Market’, each stallholder at the Port Douglas Markets must be the local grower, maker or immediately related to the stallholder’s family, so you know you’re speaking to the person that made that ice cream or grew those bananas. Winter is prime season to visit here and pick up fresh-from-the-field flowers, fruit and veggies and seedlings to plant at home, along with chocolates, honey and jars of preserved deliciousness to stock the pantry with in preparation for Christmas. Held at Anzac Park every Sunday from 8am for over 20 years, the hustle and bustle of this sprawling event buzzes from early sunrise with more than 150 stalls making these markets as much a local institution as they are a tourist attraction. The Bro Nut. The Daisy Duke. The 100 Layer Duke. The Gaytime and the Key Lime Pie. Stop talking and get in my face. You may say ‘doughnut’, but we say deep fried doughy goodness filled with as much heart and love as scrumptious fillings. 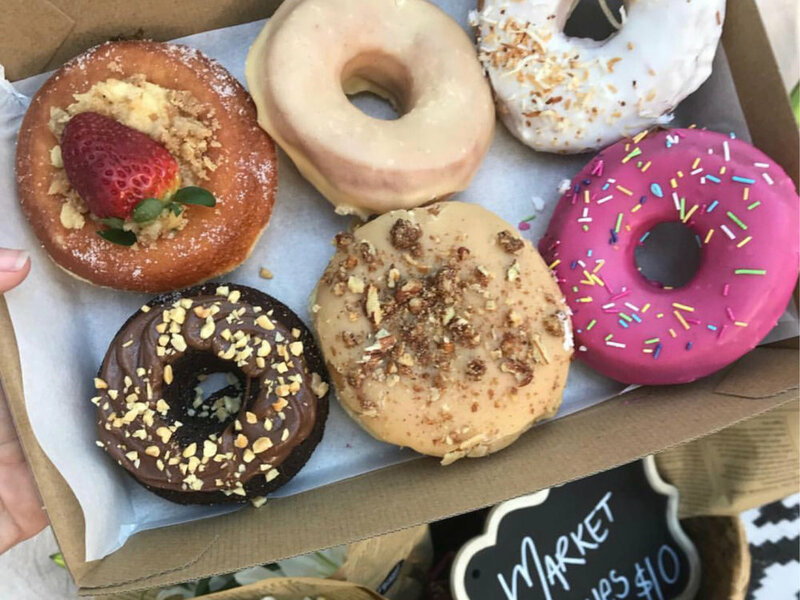 Made with the care of master baker Mike Miller, Duke’s started off as a cute hobby at the Sunday markets that swelled to epic proportions. Our advice? Get in early. The sold-out sign hits the ground faster than Anthony Mundine in a boxing ring. Feeling good and feeling fine! Another homemade gem, Granola Sundayze makes Port Douglas handmade granola from local produce. These local crunch addicts make epic flavours, like chocolate spice banana with a hint of peanut butter. A Port Douglas breakfast never sounded so wickedly good. What to do with the abundance of coconuts just laying around? Like all mamas, Casey Willets just wanted her kids to be healthier. So she collected some fallen coconuts from the beach. Her husband opened them. She flavoured them. The kids loved them. A market stall began, and before anyone could say ‘I’ve got a lov-erly bunch…’, Beach Harvest Coconuts was born, selling out at markets, collecting produce awards, making people happy one nut at a time. Flavoured chips, maple, cacao, sea salt and caramel, sweet chilli for those who like a little spice in their lives. Food trucks are the best. Crepes are delicious. Oh, what a spectacular time to be alive to combine them both! Local banana and Nutella? Yes please. Buttermilk banana pancake with Canadian Maple and cinnamon! Oh, okay then. Vegan mango and coconut with w maple or rainforest honey? Sign me up. Polish up your oui, monsieur, and get snackin’. Whether you were up doing sun salutes on the beach or regretting your choices at the Iron Bar last night, starting the day with a freshly cracked coconut in the tropics is refreshing, luxurious and instantly brings Summertime by DJ Jazzy Jeff and the Fresh Prince to mind. At The Coconut Man (not their real name, but you can’t miss it), first you drink the coconut water, then they pulp the coconut, add organic banana and drizzle raw golden coconut nectar over the top. Prefer a savoury twist? Have half your nut with banana and the other half with tabouli salad and tamari.